I wish I could help with more info about that amazing mansion. I only saw it from the pontoon boat ride we went on (see my Lake Lure article https://milliverstravels.com/2011/07/lake-lure-north-carolina). The boat captain didn’t mention anything about being able to tour that mansion. I know these are old comments, but I just stumbled upon this. According to a lake boat tour I took in September of 2016, this is the private personal home of the “afghan guy” whose name I don’t remember, but is the founder of the textile company that makes all the throw rugs, blankets, afghans, furniture covers etc you see for sale all over the place. 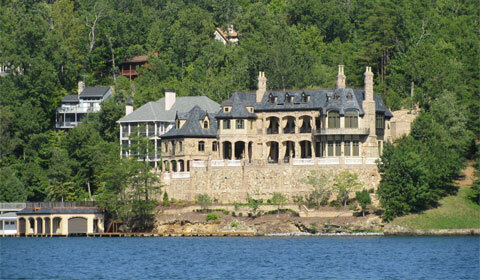 Best I remember, this is his third and newest home custom built on the lake, and at the time of the tour I took was his primary residence, which was fashioned after the famous Biltmore estate in Asheville. There were no tours or visitors allowed except that they said he occasionally has invitation only gatherings for locals.